There have been quite a few debates, trials and comparisons between potatoes that have been chitted and those which have not. Chitting is just allowing the seed potatoes to develop small growing shoots before you plant them in the ground. The bottom end of the potato is where it was attached to the root of the plant. This is a bit like an umbilical cord. At the opposite end of the potato are the eyes from where the shoots start to grow - or chit. Seed potatoes should be unwrapped immediately and set out somewhere frost free and in the light. Do not keep them in the dark or they will develop white, brittle and straggly shoots. I have these in a garden shed next to a window. I don't know much about Oca, but I assume that as these are tubers that they will need the same chitting treatment. Those lovely people at the Royal Horticultural Society are really getting the message that growing fruit and veggies is NOT a poor relation to pretty flowers. Today I went to a fantastic display of seed potatoes at RHS Lindley Hall in London. This weekend you can choose from over 75 different varieties of seed potatoes from Pennard Plants. Here at the Spring Plant and Design Show you can choose single potatoes for 22pence each! What a joy! So often I just want a few of one, and a few of another to try new varieties. Most of the time in the shops you have to buy pounds and pounds at a time when you just want one. It is on this weekend in London if you want to make your way down there. Popular varieties were selling out within hours of opening. The ultra first early potato 'Rocket' was all sold out, so the staff at Pennard Plants were amazingly knowledgeable and were able to recommend other first early varieties. I bought 5 seed potatoes of 'Vanessa' a waxy first early. I've not tried them before. Has anyone tried them? Now I've always wanted to try growing Oca - so I have now taken the plunge and bought some tubers to try this year. There were two different colours on sale, does anyone know if they are different varieties, or just varied in colour?? If you are feeling rich you could always buy some of these wonderful hand made bronze gardening tools. Never tarnish, never blunt and worth every penny! .. or how about a Buddhas Hand citrus? Spooky! The garden is still under water, but we had a couple of days without rain at the weekend so I put on my galoshes, sowester, seaboots and fishing trousers to venture out to see what's out there. My lovely Purple Sprouting Broccoli 'Rudolph' is just perfect. The tips are maturing a little like calabrese, but many of the small purple sprouts are ready now. Rudolph is one of the early varieties, and I did manage to get the plants in the ground in Summer this time, so they have made good progress. In past years I have left the planting till much later for a crop in March and April. Quite good for successional sowing because these will be finished in a few weeks. Another casualty of the flooding is my family apple tree. Don't worry about the dark patch, that is just sticky stuff I put around the trunk in Autumn to stop the apple moths climbing up to lay eggs in the buds. No maggoty apples for me. The problem here is that because the tree has been underwater for months now, it has started to lean over. You can see one of the roots at the base is visible. I will have to gradually right it with some soft ties... perhaps stockings!! Every Matron has a good supply of stockings! Nothing as bad as others in the UK, I just have to put up with not being able to walk on the grass or go anywhere near my veggie garden until the water goes. It has been months now. Flooding will leach nutrients from the soil, and prolonged flooding for months like this won't be good for the earthworms either. Leo doesn't mind at all, paddles around and explores as usual. Fresh, home made Seville orange marmalade. Perfect! So the chopped peel, fruit and pith have been soaking overnight in water. This extra soaking time really helps extract the pectin from the fruit to enable a really good set. Acid also helps this process, but as these are an acid fruit anyway, there is really no need. I used 3lbs Seville Oranges, 6 pints water and 4lbs sugar. The recipe did say 6lbs sugar but I thought I would get away with 4 ! The orange pips are amazing! These are the richest source of pectin and very often overlooked. I soaked these in water overnight too. This morning they were a mass of thick jelly stuck together! I tied them up in a muslin bag to extract a bit more whilst cooking. Just boil the orange and the pips in the water for about an hour, without the sugar. The zest takes the most cooking to go soft. Then add the sugar. This takes ages! make sure you set a whole afternoon aside because it can't be rushed. Boil down slowly until the temperature reaches Jam on the thermometer. Having said that, I tend to just test it myself to see when it is set, I don't find using a thermometer that helpful. I put a plate in the freezer then test a spoonful in the freezer for about 5 minutes. If it is still watery then test another spoonful, and again and again until it is set enough. Just draw a finger through the cold jelly until it is how you would like it on your toast! Make sure the jars are sterilized and hot. Make sure the marmalade has cooled a little then pour it into the jars a little at a time so the glass doesn't crack. Seal immediately and let it cool. Stand by for toast pictures at breakfast tomorrow! For just a few short weeks at this time of year the bitter Seville Oranges are on sale. 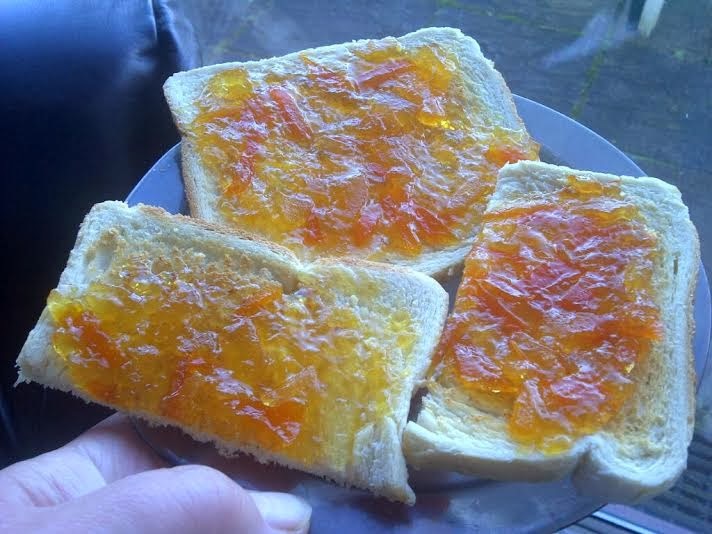 As the allotment is currently under water, it seems that making marmalade is a good way to pass the time indoors. The outer zest takes quite a bit of cooking to soften properly so I snip it into thin strips. This whole process is quite labour intensive but needs to be prepared well. Seville oranges have an amazing number of pips to remove. Probably 2 to 3 pips in each segment to remove. These will be placed in a muslin bag during cooking to release their pectin. But the pips contain a large quantity of pectin which is what helps the jelly set when cooking. I soak the chopped fruit and pips in half the quantity of water for 24 hours to help the pectin come out of the fruit before cooking. More tomorrow.